← Organizational Effectiveness: What Makes An Organization Successful? Most things do not just happen from spontaneous creation. There is imagination, planning, and effort that goes into creation and transformation. Several years ago I worked with a consultant who usually introduced himself as an “idea guy.” He would sit in a meeting and when it came time for assignments, he would say he was the idea guy and that was his real value. After this occurred a few times, I was asked to take him to lunch to discuss his career expectations. After a nice meal, I asked him how I would write a job description for an idea guy. He smiled and said that it would only need to have one task: comes up with great ideas for others. When I asked how he would know what works since he never had actually implemented any of his ideas or even someone else’s, he told me that I did not understand the true value of an idea guy. He said that most people can implement, but they do not have ideas. He claimed he was one of those people that could do both better than everyone else, but he was much more valuable if he just spent his time thinking and not doing. I left the discussion by asking if he thought his value would be greater to his employer and clients if he could think and successfully execute his ideas instead of just think. Although most of us work in a business environment where there is not enough thinking, it is hard to imagine that we would have the luxury of just thinking and not doing. In many ways, unsuccessful organizations have the same point of view. They have ideas for improvement, but do not put in the effort to change from what they are to what they could be. As a result, the level of organizational effectiveness varies. When looking at the results of organizations in various locations and industries, three phases are evident: static, transitional, and sustainable. The static organization is strong on talk and weak on execution. It possesses a weak culture, weak engagement, simple strategy, risk aversion, weak commitment to talent development, marginal commitment to performance, and a personality driven method of leadership. Once an organization realizes it can become more effective and makes the necessary changes, it begins to transform. A sustainable organization creates a very different environment than the static organization. The culture is support of performance and growth, employees are engaged at work, strategy links overall goals with individual actions, risk is accepted as part of innovation, investment in talent is a regular commitment of the organization, strong performance is rewarded while poor performance is remediated, and leadership is highly prized and supported skill. Figure 1 illustrates the three different phases and associated elements we discussed in the last post. As an organization moves from static to dynamic, the major elements improve effectiveness. For example, a static organization possesses low levels of employee engagement and dedicates few resources to improving it. The transitioning organization recognizes that engagement is important and begins the process of increasing engagement. Finally, a sustainable organization is committed to engagement and has engaged a large portion of its workforce. 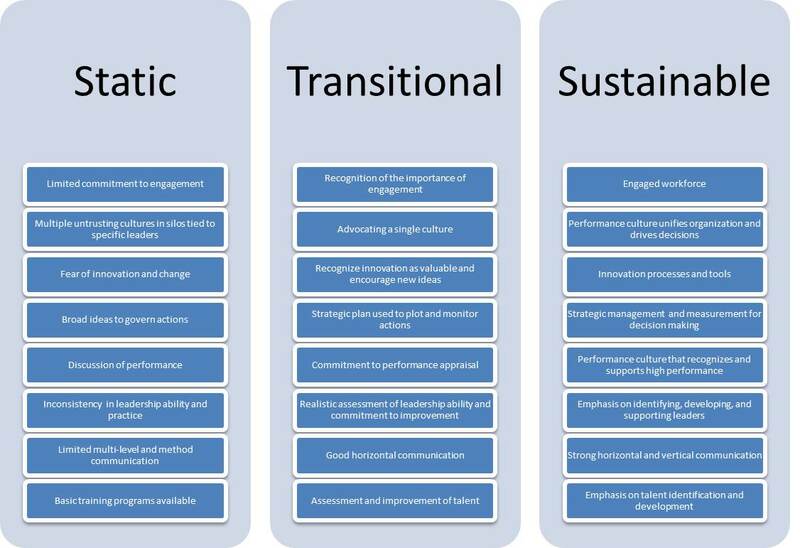 Most consistently successful organizations have reached the sustainable level on each element. This entry was posted in Leadership, Organizations, Performance and tagged effectiveness, organizational effectiveness, organizational phases, sustainable organization. Bookmark the permalink.